Jorge Lorenzo said there is only a "small possibility" he will race in the inaugural Thailand Grand Prix following a horror crash in practice on Friday. The three-time MotoGP champion was thrown in the air and went hurtling off the track during FP2 due to a technical problem with his Ducati. 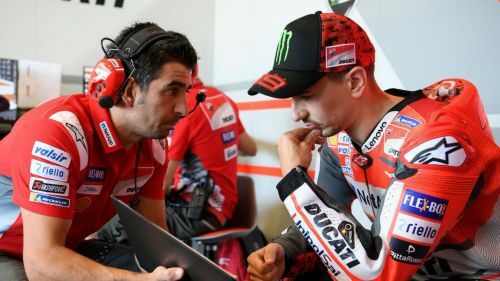 Lorenzo was cleared of any fractures when he went to hospital for an X-ray but did suffer contusions to his wrist and ankle. The Spaniard will wait until Saturday to decide whether he to compete at Buriram International Circuit. "If you ask me now, I would say no," Lorenzo replied when asked if he will be back on his bike on Saturday. "Because the last fracture, the last injury [from Aragon], is a little bit worse, it is not more broken but is more painful." Still, he was able to reflect on a lucky escape, adding: "Looking at the crash, obviously I could be much worse now. I could be much more injured, or I could have injured another part [of his body] that wasn't injured. "I'm not 100 per cent sure, but I'm nearly 100 per cent that I don't have anything broken. So that's a very good sign. "I've been very lucky for that because the crash was nasty. At this moment I am quite quiet because I know that was not my fault. "It was scary. I was scared about my foot because it really hurts. I took the impact with my back and also with the feet and I was rolling a lot. The right foot was painful. Later, little by little, it didn't get worse than before. I am lucky about that. "But it was completely not my fault because there was a technical problem of the bike. This caused the crash." Andrea Dovizioso, Lorenzo's team-mate, set the pace in the session ahead of Maverick Vinales, who had been quickest in FP1.